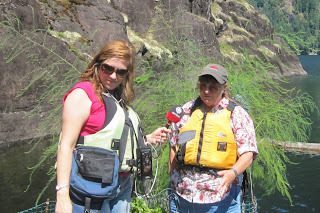 Today my float garden is highlighted on my favourite Powell River blog, Powell River Daily News. Head on over for the rest of the story. Last week I amended my vegetable garden soil with composted manure. I do this in March so the soil can rest before planting in April. Do you have a garden? Is it large or small? Do you have pots on a balcony or a few things growing in a windowsill? Gardening can take many forms. I don’t have land where I live up Powell Lake in a float cabin. My good friend John helped out by building a cedar log float with four one by two metre raised beds. It's a kitchen garden with lettuce, spinach, kale, chard, beets, carrots, onions, radishes, tomatoes, and herbs. On the cabin deck I grow other vegetables and flowers in pots. It’s not enough to be self-sustaining, but the home grown produce is a nice addition. I keep the garden tied to the breakwater most of the time. That keeps my plants away from shore and hungry critters like mice, squirrels, and woodrats. A simple pulley brings it next to the deck for gardening or to pick something for supper. Then, a gentle pull sends it back out to its protected spot. A solar panel and bilge pump let me water with a hose. I garden like you would on land, but I do have to be careful not to put anything harmful on the soil or plants because we drink the lake water after boiling. My garden is a bit unique, but it shows you can garden just about anywhere as long as you have soil, water, sunshine, and loving hands. On April 3 and April 6 (Easter Monday) my float cabin and garden were included in a CBC radio special about alternative housing across Canada. The show includes a rebroadcast of an interview conducted by Willow Yamauchi (who grew up in Lund) in 2013. You can read more about that program and hear my segment by clicking here. That is a interesting garden. I like it. I never heard of a personal float garden before now. It looks to be very productive. It all looks delightful. Happy gardening to you this coming summer. What a fascinating concept! Congratulations on your creativity. Love the reflections in the third photo. What a beautiful area. Looking forward to the images to follow of the float garden. A new concept to me. Very interesting - and what an honor. I garden a little bit on the deck - last year it was potatoes and tomatoes - that's about it - and of course flowers. This year I might just do flowers - we get less sunshine than most because of the woods across the street. Nice to see your garden on PR Daily News. What a gorgeous and creative float garden! I love the garden, it's so unique! You are amazing! It's such a wonderful life you lead. Thank you very much for sharing! I'm looking forward to seeing how your garden will look when the summer arrives. 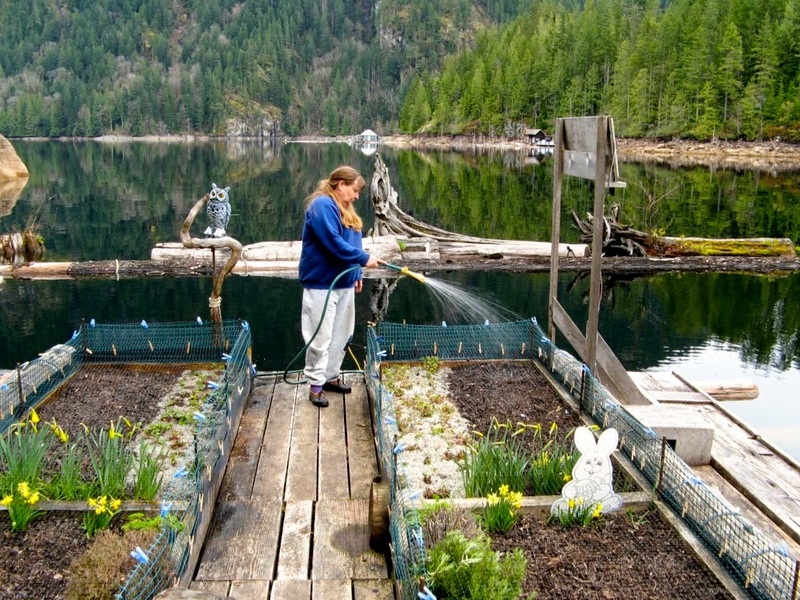 Your float garden is so neat - glad to see others recognize that! Great article Margy. It was discovering a photo of your float garden that first brought me to visit your blog, and I've been coming ever since. Truly amazing!!!! Thank you for the optimistic vision over things that can be easily done in normal circumstances... a floating garden.... Wow, you're incredible... I have, only, pots with plants in balcony, flowers like geraniums, japanese roses, some fresh green onion... (lol), small chilli... usual flowers! Thank you for your visit and for sharing with us, through your amazing post, your lovely part of the world, your stunning creative garden, too! Have a happy and sunny Spring and as beautiful as the daffodils and the landscapes I've seen in images!! Hauling in all that soil must have been a job! I admire your gumption. What a super idea! Very cool! It looks gorgeous on the lake where you are! The colors of the moss on the rocks and the reflections in the water are beautiful! Thanks everyone for stopping by and taking the time to comment on My World post this week. I really appreciate it. I have a large garden - on land. I have never seen a float garden but yours is wonderful. There are critters who want to eat everywhere. I have moles and squirrels to outsmart while yu have mice and wood rats.